Fossil Plants Fact Sheet (Graphic: Business Wire). 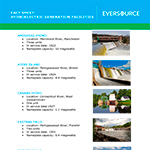 MANCHESTER, N.H.--(BUSINESS WIRE)--As a result of the proposed sale of the company’s power plants, Eversource New Hampshire customers will realize the benefits of a comprehensive restructuring and rate stabilization agreement entered into in 2015. In a filing today with the New Hampshire Public Utilities Commission (NHPUC), Eversource outlined the details of the agreements to sell the plants to two buyers. Following NHPUC and other necessary approvals, closings on the transactions are expected by late December or early 2018. This change in power plant ownership will mark the completion of electric deregulation in New Hampshire and a shift in how the company procures energy for customers in the future. The NHPUC in 2016 established the power plant auction process, which is being managed by J.P. Morgan. Under the proposed sales, which must be reviewed and approved by the NHPUC, Eversource’s three large fossil generation facilities and two remote combustion turbines will be purchased by Granite Shore Power LLC, a newly-formed 50-50 partnership between Atlas Holdings of Greenwich, CT and Castleton Commodities International (CCI) of Stamford, CT for a price of $175 million. The company’s nine hydroelectric facilities will be acquired by Hull Street Energy, LLC and affiliates (“Hull Street Energy”), an electric industry-focused private equity firm based in Bethesda, MD, for $83 million. As part of the proposed purchase agreements, the new owners must keep the plants in service for at least 18 months, and must honor a comprehensive employee benefits package established by Eversource and the International Brotherhood of Electrical Workers (IBEW). Moreover, Eversource will provide three years of tax stabilization payments to communities to the extent a power plant is sold for less than its assessed value. Consistent with the 2015 settlement agreement, customers will also benefit from Eversource’s agreement to forego recovery of $25 million related to the Merrimack Station emission reduction ‘scrubber,’ and from the financing of stranded costs remaining after the sales through the use of securitization bonds. These bonds take advantage of low interest rates. In addition, Eversource has agreed to provide $5 million from its shareholders to establish a Clean Energy Fund. Details regarding the Clean Energy Fund will be established via a collaborative process overseen by NHPUC Staff and the Office of Energy and Planning. 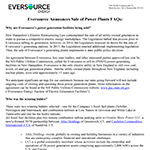 The decision to sell Eversource’s plants implements New Hampshire state public policy objectives and was part of a comprehensive 2015 agreement among Eversource and other parties, including State Senators Jeb Bradley and Dan Feltes; the NH Office of Energy and Planning; the NH Office of Consumer Advocate; and designated staff members of the NHPUC. Other signatories to the agreement included: IBEW, Local 1837; the Conservation Law Foundation; TransCanada Hydro Northeast Inc. and TransCanada Power Marketing, Ltd.; and the New Hampshire Sustainable Energy Association. Headquartered in Greenwich, Connecticut, Atlas and its affiliates own eighteen platform businesses. These companies collectively employ approximately 21,000 associates and operate from more than 220 facilities across the globe. Atlas companies are engaged in a variety of industries, including power generation, aluminum processing, automotive components, building materials and construction, industrial services, paper and packaging and supply chain management. It has successfully executed complex carve-outs of business units from companies such as Alcoa, Covanta Energy, International Paper, Johnson Controls, MeadWestvaco, Neenah Paper, NCR Corporation, ThyssenKrupp, Weyerhaeuser, and Wheelabrator Group. In each transaction, Atlas successfully navigated separation complexities and created high-performance, standalone companies. Atlas owns co-generation units at several of its industrial operations, as well as Greenidge Generation, a 106MW power generation facility that Atlas converted from coal to natural gas and biomass in 2016. CCI is a global commodity merchant with an integrated set of operations consisting of the marketing and merchandising of commodities and the ownership, operations, and development of commodities-related upstream and infrastructure assets. It owns 20 power generation assets comprising approximately 2,000 MWs across the US and Europe. CCI markets a broad range of physical commodities including electric power, natural gas, natural gas liquids, refined products, crude oil, fuel oil, freight, base metals, petrochemicals, coal and financial instruments related to commodities. CCI is headquartered in Stamford, Connecticut with offices in Calgary, Canada; Geneva, Switzerland; Houston, Texas; London, United Kingdom; Shanghai, China; Singapore; and Montevideo, Uruguay. 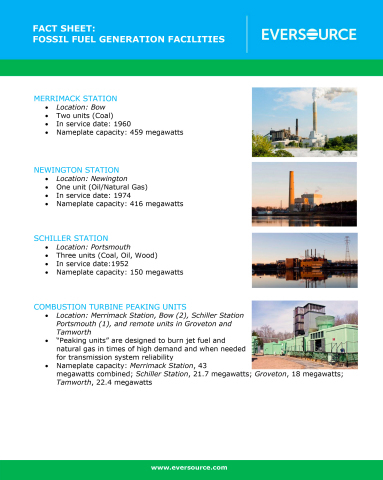 Eversource Energy today outlined the details of the sale of all of its generation plants in New Hampshire.